On September 13th I was back again at Harmondsworth, but things had changed, not for the better. 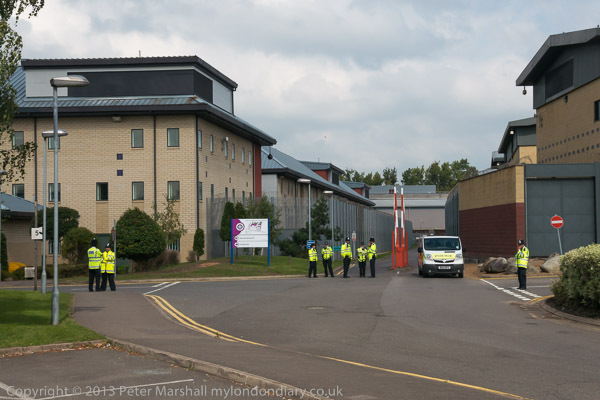 There was a new sign up in front of the buildings, and a new name, ‘Heathrow Immigration Removal Centre‘, combining what had previously been the Harmondsworth detention centre on the left of the road with the Colnbrook centre, a high security unit to its right under the very dubious ‘Care and Custody’ subsidiary of Mitie, one of the private contracting companies our government uses to distance itself from the shameful neglect and maltreatment that immigrants and asylum seekers are subjected to by our immigration laws. And, as you can see in the picture, the police were waiting for the protesters, and a couple had come to talk with those who had arrived early to begin the protest, telling them that they would not be allowed onto the site along the road next to those tall fences, where those inside the prisons would be able to see and hear them. 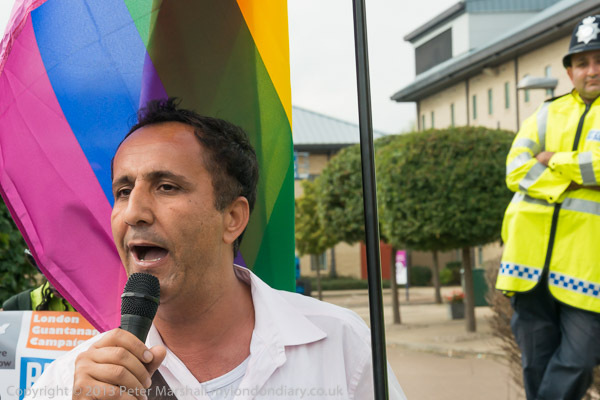 Police blamed the change in policy on the new management, although protesters suspected it was perhaps motivated by the increasing tension inside these and other immigration prisons following the death of Rubel Ahmed eight days earlier in Morton Hall immigration detention centre in Lincolnshire after he was refused medical treatment for chest pains, despite being heard by other prisoners screaming in agony. The prisoners took over the centre in protest and their resistance was brutally suppressed. When I arrived protesters were arguing about their right to protest around the prison with one of the police officers, and I moved close to photograph this. 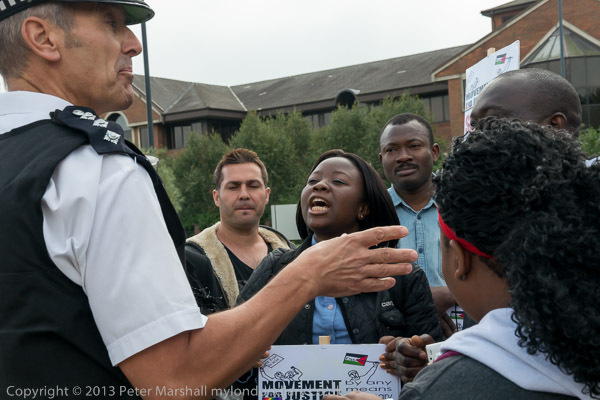 It was easy to photograph either the police officer or the protesters, but rather harder to get a picture which shows both in a meaningful way, and I think the image above was the closest I came to it – there are a few others of the situation in Close UK Immigration Prisons on My London Diary, so you can make up your own mind. Photography is very much a matter of making judgements, both when taking images and editing them. 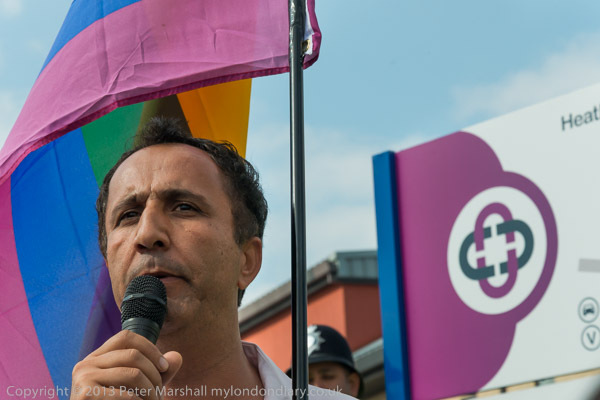 I’ve photographed the man below with his rainbow hat at several protests, and obviously he is a pretty colourful subject. I took quite a few pictures of him, particularly when he was blowing the bright red horn, and again this is the image that I think works best. Firstly there is the framing of him, cutting that horn neatly at the left edge and the red edge of his hat just at the top edge of the frame. But the background is also important, showing the crowd of people. The two women’s faces at each edge help, but it is particularly the various texts that made me pick this frame. 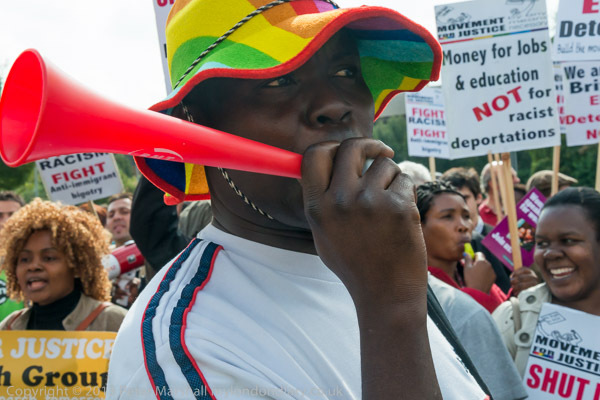 Going around the frame there are words like Justice, Racism, Fight, Shut and the complete placard, just tangential to the red hat band, the well known protest refrain ‘Money for Jobs & education NOT for racist deportations’. That red band also just touches the man’s right eye (on our left) – had my camera been an inch higher it would have been lost. It’s partly a matter of luck that all these things came together in this frame, but also a matter of working on the subject and feeling for the it until luck happens. What perhaps this picture doesn’t on its own shown is the incredible dynamism of the protest, though I think the colour and composition gives some indication. Again there are other pictures on My London Diary. The next two images show a former prisoner in the centres talking about the conditions inside, and I was quite please with both of them. I wanted to photograph him speaking, and was attracted by the similarity of the colour in the flag and that of the Mitie sign and worked from a low position to combine the two. Standing up and moving very slightly I could show him speaking with the prison building more clearly behind and the police officer watching him. Despite both having the same man and flag, I think these images have a very different feel to them. I think I prefer the lower one, mainly because of the greater animation of the speaker. I tried hard and in several ways to show something of the dynamic nature of the protest and am not completely happy with any of my images (not that I ever am, though a few I feel quite please by.) 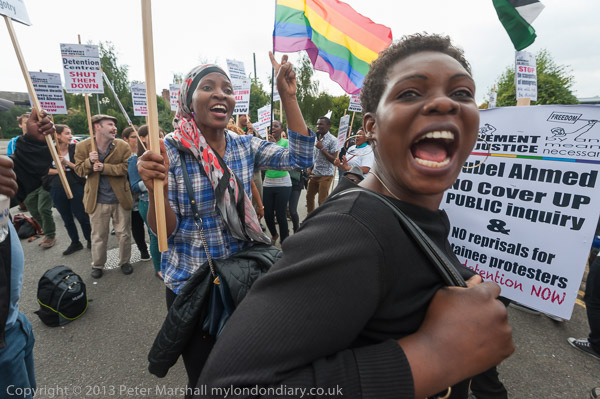 One that does have some appeal, largely because of that wide open mouth and grinning face so close to my wide-angle lens perhaps show something of the energy of the protesters. Many of them have suffered inside these prisons, some still face the agony of reporting and knowing they may be locked up and deported, and others have lost friends or relatives sent back to uncertain or dangerous futures, imprisonment and worse. I’ve written on previous occasions about the issues involved and the attitudes that lie behind (and too often politicians and others do lie) the shameful treatment this country hands out, particularly to those from countries that we grew rich from in the days of the British Empire, and continue to exploit through multinational companies. It’s important that people learn more about what is actually happening behind the high fences and locked doors of centres like this and the whole mindset that allows it to go on in what is still claimed to be a civilised and democratic country. And that they are closed down. This entry was posted on Monday, November 17th, 2014 at 12:29 pm and is filed under My Own Work, Political Issues. You can follow any responses to this entry through the RSS 2.0 feed. You can leave a response, or trackback from your own site.